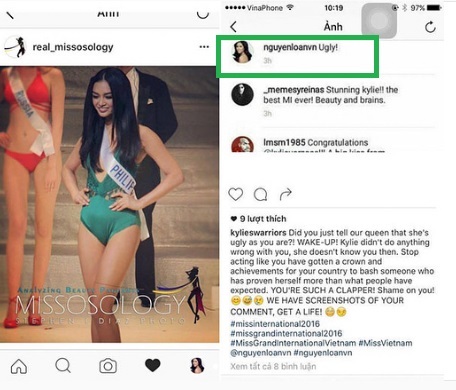 Newly-crowned Miss Universe Vietnam 2017 Nguyen Thi Loan has apologized to Miss International 2016 Kylie Verzosa and Filipino pageant fans for her "ugly" comment on Kylie Verzosa's swimsuit photo posted in Missosology's Instagram back in 2016. Kylie Verzosa's fans have taken to Nguyen's social media accounts in protest after it was revealed that the new Miss Universe Vietnam made an "ugly" remark to Kylie Verzosa during Miss International pageant last year. I would like to clarify a comment that I made last year. Please give me a minute to explain. 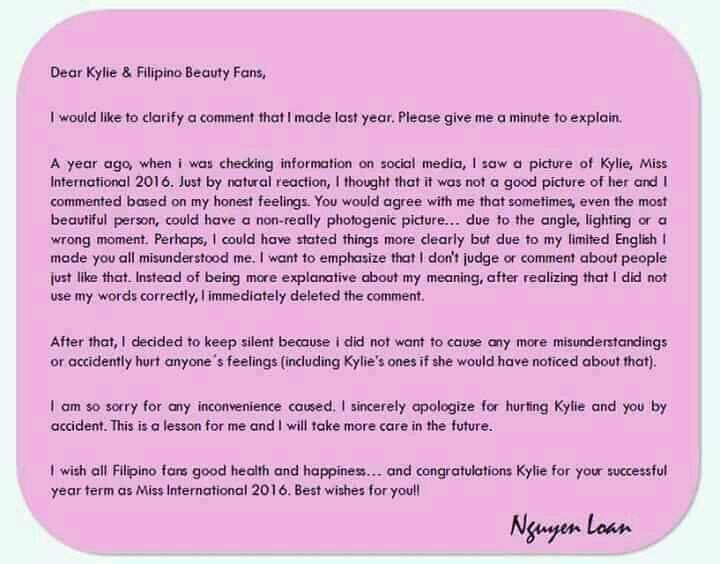 A year ago, when I was checking information on social media, I saw a picture of Kylie, Miss International 2016. Just by natural reaction, I thought that it was not a good picture of her and I commented based on my honest feelings. You would agree with me that sometimes, even the most beautiful person, could have a non-really photogenic picture... due to the angle, lighting or a wrong moment. Perhaps, I could have stated things more clearly but due to my limited English I made you all misunderstood me. I want to emphazise that i don't judge or comment about people just like that. Instead of being more explanative about my meaning, after realizing that I did not use my words correctly, I immediately deleted the comment. After that, I decided to keep silent because I did not want to cause any more misunderstandings or accidentally hurt anyone's feelings (including Kylie's ones if she would have noticed about that). I am so sorry for any inconvenience caused. I sincerely apologize for hurting Kylie and you by accident. This is a lesson for me and I will take more care in the future. I wish all Filipino fans good health and happiness... and congratulations Kylie for your successful year term as Miss International 2016. Best wishes for you!!" Nguyen is no stranger to the world of pageantry as she was Vietnam's representative at 2014's Miss World pageant and one of the Top 20 semifinalists during 2016's edition of Miss Grand International in Las Vegas. She also joined Miss Vietnam Universe in 2015. 27-year-old Nguyen was appointed to represent Vietnam at the upcoming Miss Universe 2017 pageant on November 26 in Las Vegas, Nevada.